This is a 4 mile race with staggered start times. The race will start at Geleb Farm, S Bank, Turweston. As car parking may be limited please CAR SHARE or perhaps do a warm up jog!. A link to the route is below. As this race will be on open roads all runners MUST wear high viz and run against the traffic flow ie on the right hand side of the road in both directions. This is particularly important in the April qualifying, where light is usually limited. Please note that for 2019 the final will be run on a Sunday morning (29th September), this is due to the failing light at this time of year for evening runs on open roads. We will endeavour to combine this with a club social event also. PLEASE ENSURE YOU KEEP AN EYE ON THE FACEBOOK GROUP POSTS FOR UPDATES ON THIS. The staggered start tries to ensure everybody finishes at approximately the sme time. The winner is the first runner ‘home’. Numbered tokens will be handed to finishers as they cross the line. The tokens and names will be matched up to times after the event. Timing will be done by stopwatch. At event 1, your handicap, and therefore your start time, will be extrapolated from your park run PB. If no park run time exists then these runners will start at the same time as the first runner. Subsequent event start times will be adjusted based on your previous performance. See below. Entrants to the time trial will need to comment on the facebook post about start times before 6pm on the day before the event so that start times can be calculated and published. Meeting time for the race will be published the day before the race based on 10/15mins before the first runners start time. Entrants will also be able to use these runs towards their club standards submission, if they wish, though because this is not an officially measured distance the committee reserve the right to apply some discretion to submissions. *These dates are currently provisional. Members will be notified on Facebook if and when they change. Events a to e are qualifiers for the finals time trial in September. Awards will be presented to the first 3 home (regardless of gender!). Entrants must run at least TWO of the 5 time trials to take part in the final. a. If you beat your handicap, ie you arrive before the set finish time, your start time for the next event will be adjusted down by 90% of the time you beat the finishing time by, and your start time will be adjusted accordingly. b. If you fail to break your handicap, i.e. you arrive after the set finish time, your start time for the next event will be adjusted up by 50% of the time you finished after the target finish time. 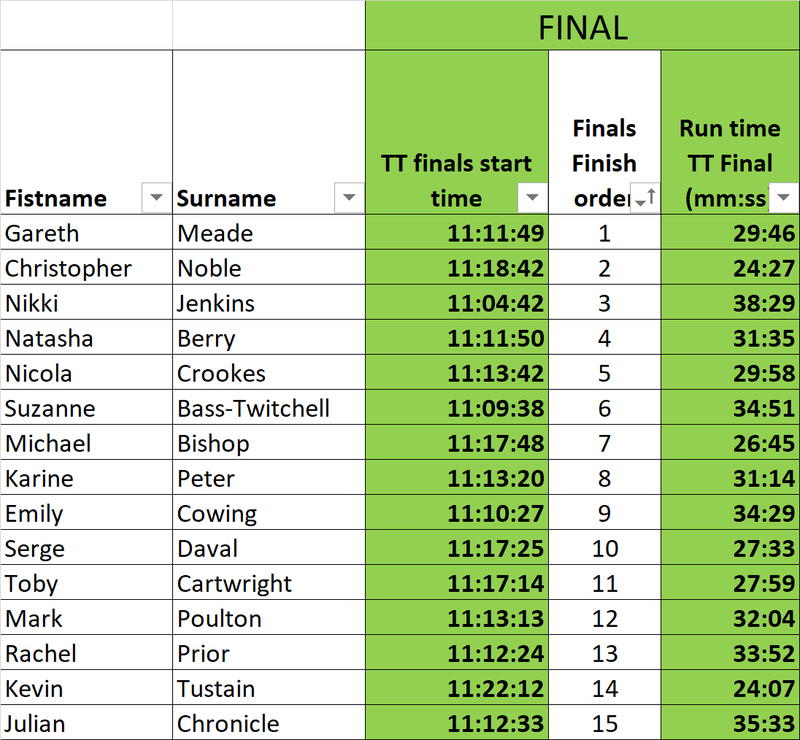 c. For the final the start times will be calculated based on runners best time in the qualifying time trials. The organisers reserve the right to amend start times in order to keep the race fair and competitive.